1. So the B.K. Kim era in Boston is at last over and with it ends Jose’s long avoidance of learning to spell the righty’s full first name. Jose could learn how to spell Mientkeiwicz, but someone How Byung Hyo—well, whatever the hell it is, always escaped him. And so in the final analysis, the Kim-Hillenbrand trade joins the elite company of the Cooper-Whiten trade and Jose’s trade of a Lou Whitaker card for a Bobby Thigpen card right after Thigpen set the single season save record among trades where each side thought it was ripping the other off. The Sox sent Kim to Colorado for $315,000 of his salary paid and veteran catcher Charles Johnson who they immediately designated for assignment and then released in order to reap major tax benefits. While the unsuccessful end of the Kim era is regrettable, the Red Sox have really done us a service in demonstrating how the acquisition and release of veteran players can defray one’s tax costs. For instance, Jose just discovered that he owes the federal government almost $1,000 this year, so he is now actively looking into acquiring either Todd Zeile or Robin Ventura in order to gain a valuable write off. Was anyone really surprised that lefty specialist Mike Myers is returning to the Red Sox? Jose certainly wasn’t. So Hideki Matsui, Garrett Anderson be forewarned. One of these days, you’ll be minding your own business in the batter’s box and it will slowly creep up on you…slowly… you’ll check the signs… oh God it’s coming… you’ll steady your bat… it just keeps coming…. so slowly… and now it’s curving… and then, when you least expect it… STEEEERRIIKKEEEE THREEEEEEEEEEE!!!! Mike Myers has struck again. It’s time for Jose Melendez’s KEYS TO THE CHANGE. 1. It is with a fair modicum of sadness (note: as Mighty Thor would put it) that Jose must inform you, his faithful readers, that he is saying to hell with you all and moving on to greener pastures, up the food chain and any other number of clichés. Jose wanted to end his career with blogspot, but they wouldn’t up their offer from zero dollars. That just didn’t show Jose a lot of respect. This is probably a good thing for Jose. Over the course of the off season, he had stopped taking care of himself; the famous work ethic was gone and injury problems were beginning to emerge. Now, Jose will be motivated by a desire to prove the critics wrong. You said Jose was in the “twilight of his career.” Wait, that was Roger Clemens? Nevertheless, Jose will still prove you wrong. But is it really a surprise that Jose sold out? It shouldn’t be. What should be surprising is how little he sold out for. As best he can tell, he sold out in return for a subscription to ESPN Insider – cash value: $15. So if any of you have a crisp $20 bill and want your own personal Red Sox blogger, definitely drop Jose a line. But let’s not pretend this is all about Jose. (Note: This is all about Jose.) There will be many benefits to you the fan as well. For instance, Jose you will have access to an exclusive, subscription only “Jose Insider” service, which will offer choice tidbits to paying customers. If you want to hear trade rumors started by Jose’s drinking buddies (note: such as minor leaguer Shawn Wooten for former UCLA coach John Wooden), or know what Jose ate for breakfast (note: Coffee. That is all.) Jose Insider is the place for you. The new site will also offer a rare opportunity for those of you too cheap to buy the KEYS book a chance to learn Jose’s real name. 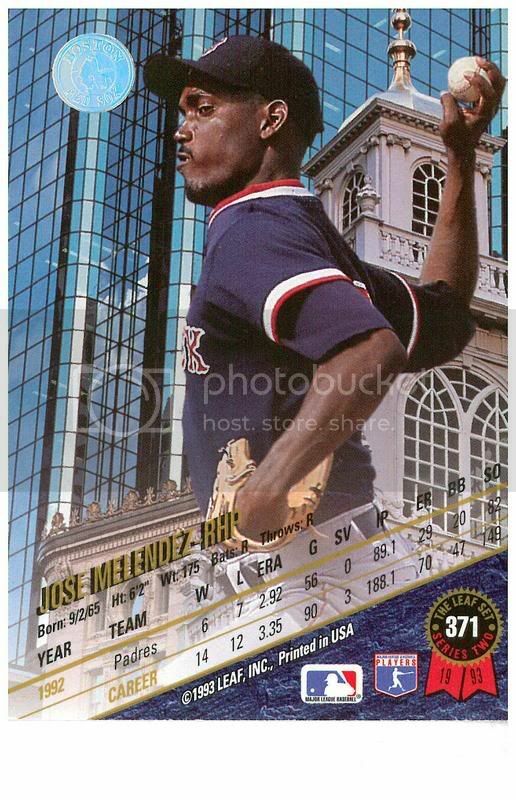 (Note: It’s Jose Luis Melendez Garcia, apparently.) Finally, you will at last get the chance to see Jose in tag team action along with Tao of Manny’s Brian Young. This arrangement will be great for everyone until ratings sag and we need a new story line like Jose super kicking Brian through a plate glass window. Yes, everyone wins. But especially Jose wins. 2. The most troubling revelation emerging from recent commentary on the Red Sox 2004 playoff run is that General Manager Theo Epstein got drunk off of vodka tonics following the disastrous Game 3 of the ALCS. Jose is not troubled that he got drunk, we should be happy he wasn’t shooting smack in canvas alley after that game, it’s how he got drunk..
Theo could be an exception to the rule, but vodka tonic is not a thinking man’s drink. It is neither cheap, like Pabst nor delicious like good whiskey or a Sam Adams. It is an expensive alcohol delivery system. No more… no less. If Theo was just trying to get drunk, Jose would be much happier if he bought a few 40s of OE. 3. Speaking of B.K. Kim, he gave a rare interview to the Boston Globe’s Chris Snow, yesterday. Kim told the Canadian reggae legend that he believed he was at about 70 percent following an outing in which his fastball peaked at 87 mph. While most sports writers, fans, teammates, groupies and focus groups are focusing on the negative concerning Kim, Jose prefers to focus on the positive. If Kim is throwing 87 mph at 70 percent, when he is 100 percent, by Jose’s calculations, his fastball will top out at 124 mph. And people don’t want this guy on the roster? I’m Jose Melendez, and those are my KEYS TO CHANGE.